This is a nice 14"x7" Ford bolt pattern 5-slotted aluminum mag. I'm not sure who it's made by. 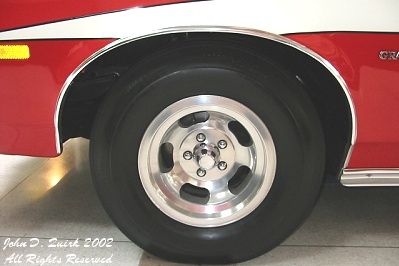 The tire is a 25+ year-old Goodyear HR78x14 Bias Ply. Nice looking, original tire, but hard as a rock and not fun to drive long distances. I have recently put brand new radial tires on the car (not pictured). They ride a million times better, but they aren't as nice looking as the originals.